Description A chance seedling found by Darrel Caudle near Dryden, Washington in 1987. The fruit quality is firm, crisp and characterized by a highly appealing subacid, aromatic flavor. Fruit shape is conic, very similar to Delicious but without the bumps on the bottom. 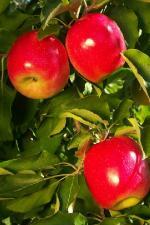 The apple color is bright red stripe over creamy background. The tree is a semi-spur with good vigor, precocity and high productivity. Mildew, scald, bitter pit and watercore have not been observed on this variety. Matures one week before Fuji and has a long picking window with Storage quality comparable to Fuji. Pollination Information Cameo blooms in mid-season and will pollinate all other early blooming apple varieties, varieties blooming in the middle of the season, and also varieties blooming late in the season.